Founded in 1957, Servometer® developed, refined and patented a revolutionary and unique electrodeposition process to manufacture electrodeposited miniature nickel bellows, flexible couplings, electrical contacts and rigid electroforms. These miniature, electrodeposited metal bellows would prove to be a unique product with wide spread demand and limitless advantages for the marketplace. Today, Servometer is a global leader in the production of precision electroformed metal bellows and related bellows-type products. For over 55 years, OEM contractors from around the world within the Aerospace, Military, Defense, Medical Semiconductor and Oil and Gas industries have relied on Servometer precision components because of their high quality and reliability. Our metal bellows serve as mission critical components in everything from automation and robotics, to power supply, motion control…and so much more! Servometer bellows and related products can be found in the space shuttle propulsion system to help control the rocket motors; in military fighter jets where they stabilize cabin pressure; in life-saving fire suppression switches in military armored vehicle Humvees; in astronauts’ oxygen supply system for the last 25 years; in various medical devices that help regulate body temperature during surgery ; in oil and gas platforms as volume compensators maintaining positive pressure on a fluid system while adjusting for volume fluctuations in a system, and more! In 2007, Servometer added an edge welded bellows division to our product offering, when we acquired BellowsTech in Ormond Beach, Florida. Edge welded bellows are ideal for customers who have higher temperature and higher pressure applications, especially in harsh environments such as the oil and gas industries. Acting as an extension of your design team, our aim is to produce a custom-engineered solution to meet your exacting specifications and requirements. Our highly experienced professionals and skilled technicians will use our proprietary technology to manufacture your unique premium parts. If you need assistance with part assembly, our expert design engineers can provide assembly solutions as well. 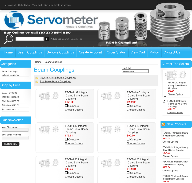 Servometer also offers standard parts off-the-shelf for your convenience, and has established an online web shop for convenient and easy ordering 24 hours a day, 7 days a week. Our customer service team will be happy to assist you in placing or expediting a standard part order to your complete satisfaction. At Servometer we take pride in our commitment to customer service and product integrity. We are continually striving to improve on our lean manufacturing and processing efficiencies. Servometer is ISO 9001:2015 certified.